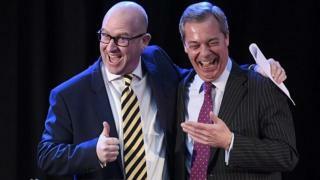 Can Paul Nuttall avoid the fate of Moyes? 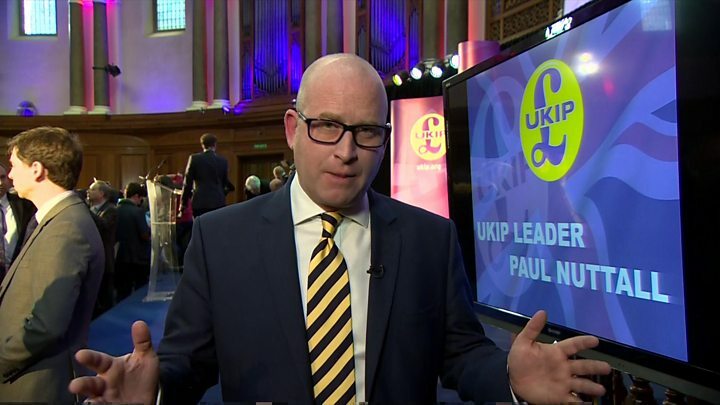 In his acceptance speech, Mr Nuttall, a former history lecturer who played football for Tranmere Rovers as a boy, said: "The country needs a strong UKIP more than ever before. If UKIP is to be an electoral force, there will be an impetus on Theresa May and her government to give us a real Brexit." Appearing on BBC Two's Daily Politics, Mr Nuttall said the party would be "speaking the language of ordinary working people... we're going to move into the areas the Labour Party has neglected", dismissing Labour leader leader Jeremy Corbyn and John McDonnell and Diane Abbott as part of "a North London Islington set". He said: "We will be focusing on the issues that really matter to working-class people on doorsteps - immigration, crime, defence, foreign aid, ensuring that British people are put to the top of the queue in the job market." Ms Evans said Mr Nuttall had her "full support", saying she was glad he won such a decisive victory because it gave him a "huge mandate" to unite the party. Mr Nuttall, who was born in Bootle, Merseyside and was UKIP deputy leader from 2010 until September this year, attracted 9,622 votes. Ms Evans came second with 2,973 votes (19.3%) and Mr Rees-Evans third with 2,775 votes (18.1%). There were 32,757 ballot papers sent out, with 15,405 votes cast. A Conservative Party spokesman said: "Now on their third leader in as many months, UKIP are too divided, distracted and incompetent to offer any serious solutions for the people of Britain. "After a leadership contest, which the winner himself has described as 'completely shambolic', we've seen brawls and squabbling - but nothing about the issues facing ordinary working people." Labour MP Dan Jarvis said the party could not be "remotely complacent" about the threat posed by UKIP and had to listen to voter concerns about issues like immigration. He called for the party to appoint a frontbencher to deal specifically with the issue. 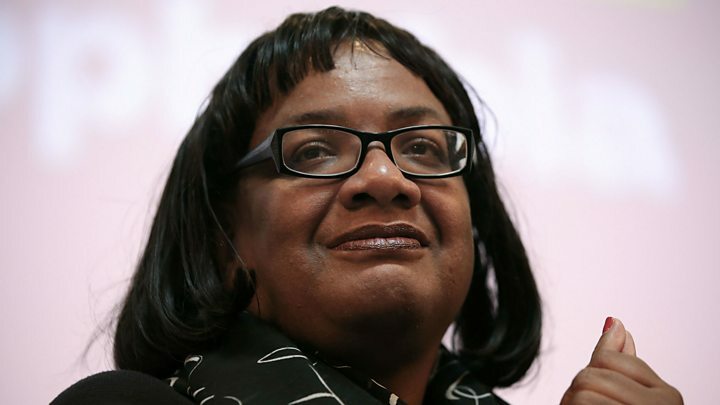 But shadow home secretary Diane Abbott said this was not necessary, telling BBC Radio 4's The World at One Mr Jarvis "clearly has not been talking to many people in Europe" if he thought changes could be made to EU free movement rules while being involved with the single market. She added: "The fact is that immigrants themselves are not responsible for low wages." This was a commanding, thumping win for Paul Nuttall. The scale of his victory matters. His pitch was that he was the only person able to bring the party together and heal its divisions and this gives him a mandate to do so. His approach will be different from that of Nigel Farage, whose focus was on appealing to Tory voters. Mr Nuttall wants UKIP to become the authentic voice of the working class by talking about issues that Labour finds problematic. It was no coincidence he spent much of his speech attacking Jeremy Corbyn and his allies. Beating Labour in the North of England will be a mountainous task - and it remains to be seen how this strategy will appeal to the party's libertarian wing - but it is not impossible, as the SNP has proved in Scotland. But first he will have to deal with the huge tensions and personal animosities in the party. He will take comfort from Mr Farage's insistence he won't be a back-seat driver. But Mr Nuttall, an MEP for North West England, said, under his leadership: "There will be one theme - unity - because only unity breeds success." Mr Nuttall's first act as leader was to appoint London Assembly member Peter Whittle as his deputy. He also offered Mr Farage joint honorary presidency of the party. Paul Oakden will stay on as party chairman and MEP Patrick O'Flynn - a close ally of leadership rival Suzanne Evans - will be his principal political adviser. Douglas Carswell, UKIP's only Westminster MP, tweeted: "Thrilled and delighted by UKIP new leader Paul Nuttall - clear new strategic direction!" But Liberal Democrat leader Tim Farron predicted Mr Farage would be "back in the leadership after a few weeks of recharging his batteries stateside", adding: "UKIP do not speak for Britain and their brand of reactionary, divisive politics threatens the character and cohesion of our society." Speaking ahead of Mr Nuttall's election, Mr Farage said he had a "certain sense of déjà vu" given the party had only had a leadership election in September but insisted he was stepping back and would not be a "back-seat driver". He said he was "confident" about UKIP's future, saying it had shifted the "centre of political gravity" in UK politics and had been the inspiration for Eurosceptics across Europe but also Donald Trump's successful presidential campaign in the US. Nigel Farage (2006-2009 and 2010-2016): The face of UKIP for more than a decade, he served two stints as leader, during which UKIP became a major force in British politics. He quit briefly in 2009 and again in 2015 only to change his mind. Lord Pearson (2009-2010): The former Conservative peer was elected leader in late 2009 but the party underperformed at the 2010 election and he quit soon after, saying he was not "much good" at party politics. Roger Knapman (2002-2006): A former Conservative MP, he joined UKIP after the 1997 election and became leader in 2002. Stood unsuccessfully for Parliament in 2001 before becoming an MEP in 2004. Stood down in 2006. Jeffrey Titford: (2000-2002): A popular figure who led UKIP into the 2001 election and served as an MEP for a decade. Michael Holmes (1997-1999): Served as leader for two years and was elected to the European Parliament before quitting after an internal power struggle in 1999. Subsequently left the party. Alan Sked (1993-1997): Formed the Anti-Federalist league, which later morphed into UKIP. The academic has since been critical of UKIP, describing it as "Frankenstein's monster". Is Nigel Farage heading for the Lords?